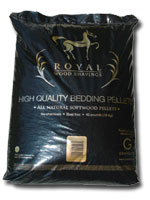 These all natural, softwood pellets are dust-free and manufactured specifically for animal bedding. These are sold in 40 lb. bags and delivered by the ton.